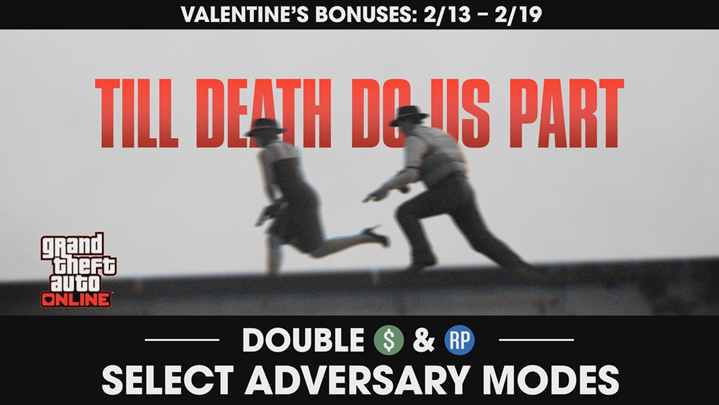 GTA Online celebrates Valentine’s Day in its latest event, with discounts across its stores, as well as a new vehicle and a timed special event. Legendary Motorsport sees the addition of The Vapid Hustler vehicle, and from February 13-19 the Till Death Do Us Part event will grant double GTA$ and RP throughout select adversary modes. Till Death Do Us Part pits up to four pairs against one another, with only one life between each pairing. Your partner dies; you die. Other events to receive double GTA$ and RP are Slasher, Resurrection, Deadline and Lost vs. Damned. In addition to all these goodies, there will be discounts on select vehicles, properties, clothing/accessories and weapons. Also, jumping into GTA Online from February 16th will net you a GTA$ gift in March. More details of that will be revealed this Friday. Not a bad time to get into GTA Online for the first time, or to jump back in if you’re already a fan. The Valentine’s Day event runs from February 13-19.